Working at Northampton Wools is like being a kid in a candy store. I walk around in a daze of yarn-induced ecstasy, touching everything within my reach and losing myself in the swirl of color that surrounds me. I have been known to leave the shop at the end of a work day owing them money, and most days come home with only a portion of my earnings, but with gorgeous wools in my bag. Like today, for instance. 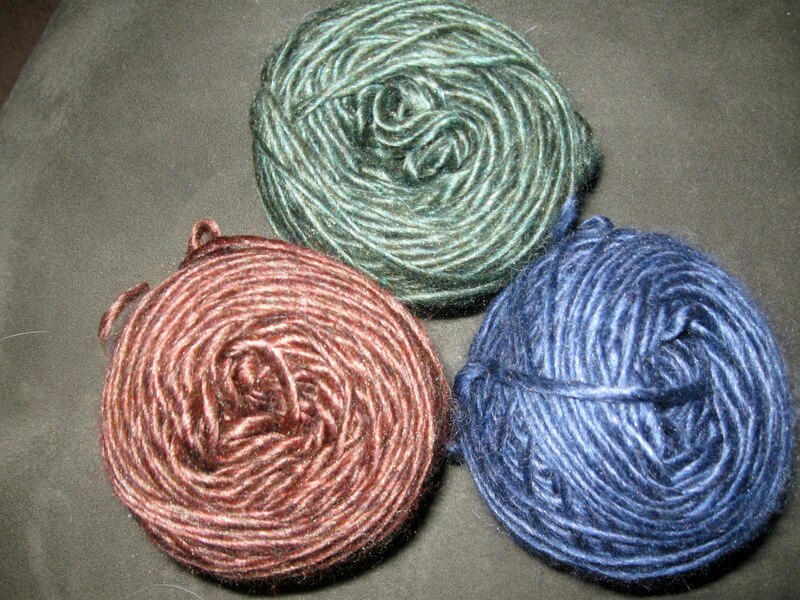 I left with only $14, but also three skeins of divine Mulberry Merino in three stunning colors. This is a 52% Mulberry Silk, 48% Merino blend that is incredibly soft and has a lovely silky sheen. Any ideas for what I should make with it? It’s only three hundred yards, so I was thinking a complex scarf pattern incorporating all three colors would be interesting. Send me any ideas you have!